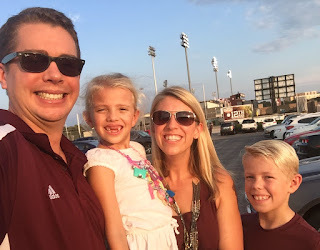 Chasing Roots: Aggieland is Home. First, thank you so much for the congratulatory remarks sent to Tom and our family with regard to last Monday's post! Both he and I appreciate your kind words now and your unending support throughout the last six...12...18 years. Second, I realized during a brief conversation with a friend that in Monday's post I neglected to address a couple of important related details. As a result, today's post comes as something of a follow-up - an opportunity to address two "frequently asked questions". 1. What does tenure mean for Tom's career? Many people incorrectly understand academic tenure as job security for life. Many also assume that tenure means the work load suddenly decreases and/or that recipients no longer (have to) give 100% on the job. More accurately, tenure is an indefinite appointment but one that can be terminated for cause or under extraordinary circumstances. The status was created to protect academic freedom and those who choose to research potentially controversial topics: "the common good depends upon the free search for truth and its free exposition". Tenure does not offer job security for life. It does, however, offer a higher level of job security than private sector positions; this advantage was designed to give academic jobs a fighting chance when pitted against private sector jobs with significant financial advantages. Tom's workload hasn't decreased in the slightest now that his title has changed from Assistant to Associate Professor. In fact, he missed the TAMU tenure reception because he had too much work to accomplish - multiple deadlines to meet - that afternoon. While I know there exists an occasional professor who commits less of themselves to the job after receiving tenure, from what I have seen firsthand, this rarely occurs. As I wrote last Monday, the men and women who choose academia do so because of a personal commitment to expanding knowledge, advancing science, and developing the next generation of community leaders. That desire to make a difference doesn't just burn out on the day tenure is awarded. 2. What does tenure mean for your family? When we moved to the Lone Star State at the end of 2010/beginning of 2011, we knew we would stay for at least three years. (Tenure-track professors are reviewed after three years and are at that point either given approval to continue working toward tenure or asked to find another job.) During those first three years we talked about leaving - we even put the beginnings of planning to leave into motion - multiple times. The workload and the pressure of not knowing if he would pass his review put a tremendous amount of stress and pressure on Tom, and I felt the heavy burden of (what seemed to me) my inability to keep our family on track mentally, emotionally, and physically. When Tom passed his review, we committed to an additional three years. We decided that if he wasn't awarded tenure we could move wherever he found a new job, and if he was awarded tenure, we could consider using that leverage to secure for him a job at a college or university closer to our native Midwest and our families. Sometimes I think about the many characteristics of Texas I dislike. (Just call me Debby Downer for a minute or two.) As I type this post on the first day of fall, the temperatures outside have climbed into the 90s and we have nearly 100% humidity. I can't stand hot weather and I have a love/hate (but mostly hate) relationship with humidity. On my back porch rests half of a lizard thanks to Tux's most recent "playdate". I despise lizards...as well as all of the critters who live around here, for that matter. This week I spent countless hours trying to figure out how to get my family of four to Northern Wisconsin for Christmas, a process that proved both logistically difficult and financially challenging. I wish we didn't live so far from our families. I could go on, but I won't...because that's not the point of this post. The point of this post, if you haven't yet figured out where I'm going, is that somehow we have created such a magnificent life for ourselves here that I - we - can overlook everything we'd rather do without in favor of embracing everything we have. Never in my wildest dreams did I imagine that when the time came - when the opportunities to leave arose - we would choose to stay. A couple of weekends ago Tom and I had the surreal experience of meeting ourselves seven years ago. This young couple with two young children just relocated to Texas from across the country to pursue tenure at TAMU. They said they'd never move to Texas, yet here they are. They say they won't stay, and we get it, because we said the exact same thing more times than I could count. Texas looks, sounds, feels - IS - different from anywhere else either Tom or I have ever lived, in good ways and in ways that don't fit me quite as well...they feel the same way. I couldn't picture a life for us here...they feel the same way. But at some point, we opened our minds just enough to let Aggieland sneak in and leave its mark on our hearts...I hope they someday feel the same way. So yes, Aggieland is home. Aggie best as we were on our way to watch a TAMU soccer game.